Segmental retaining walls (SRWs) or modular block retaining walls have gained popularity over the years as a soil retention technique because of their economy and speed of installation, the flexibility of geometric configuration, and the variety of blocks available in the market to suit a project’s architectural and aesthetic requirements (Figure 1). SRWs can also tolerate much larger post-construction settlements compared to conventional reinforced concrete retaining walls. Depending on wall height and individual block dimensions, stacks of these blocks may form the primary retaining component themselves as a ‘gravity’ retaining wall (Figure 2), or may serve as the facing blocks of a larger retaining wall system that is mechanically reinforced with geosynthetics or metal strips (Figure 3). The latter type is commonly known as Mechanically Stabilized Earth (MSE) walls which have been widely used in the last three or four decades in various land development and transportation applications. Locally, the Ministry of Transportation Ontario (MTO) has designated such systems as Retained Soil Systems (RSS). Not to be confused with the same acronym for ‘Reinforced Soil Slopes’ as adopted by the Federal Highway Administration in the USA for MSE walls that are flatter than 70 degrees from the horizontal. Many SRWs are proprietary systems. The manufacturer or supplier of these SRW blocks typically provide generic design drawings, specifications and installation manuals accompanying their products. The design and installation recommendations of most manufacturers follow the guidelines published by the National Concrete Masonry Association (NCMA) or the Federal Highway Administration (FHWA) of the USA. 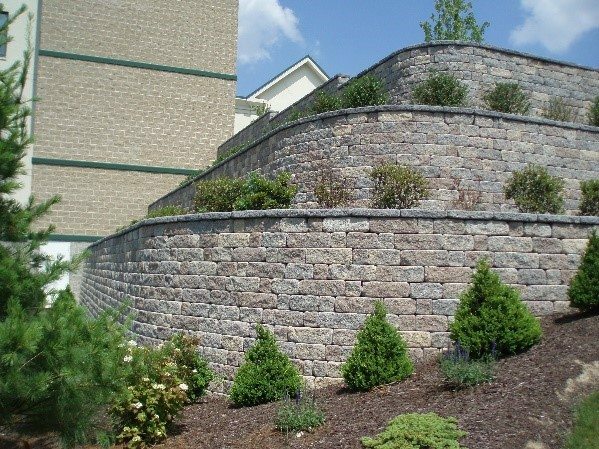 While SRWs have been used in small, ‘do-it-yourself’ landscaping applications, the Ontario Building Code requires any retaining wall greater than 1 m in height to be designed by a Professional Engineer. The design and construction of SRWs, especially the MSE type, can be quite an involved process. Because of the proprietary nature of these systems, confusion often arises as to who the designer/engineer-of-record of the system is and how different parties should interact throughout the planning, design and construction process. While public agencies such as the Ministry of Transportation Ontario has established guidelines, quality control and review procedures for the design and construction of these systems, the private sector projects (e.g., SRWs supporting residential, commercial or industrial backyards, driveways and parking lots) often do not benefit from adequate technical, administrative and project management oversight. Our experience investigating failure or excessive movement of these SRWs indicates an inadequate understanding of the planning, design and construction process leading to frequent insurance and legal claims. This article describes two case histories about SRW/MSE wall performance in Ontario, with project details withheld for confidentiality reasons. The scope of the discussion presented here applies to SRWs or MSE walls more than 1 m in height that require design by a Professional Engineer. The focus of this article is not on the technical details of design and construction that led to damage or damage mechanisms, but on the underlying shortcomings in the design, construction or procurement process that lead to damage and claims. Case History 1: The project involved tiered or terraced MSE walls with modular block facings, located behind a multi-story residential building. The site topography made for challenging design and construction conditions with an overall retained soil height on the order of 25 m. The owner of the project commissioned a geotechnical investigation when the project was at a conceptual design stage. The final design and construction of the retaining walls were completed some 10 years later. The prime consultant/civil engineer retained by the owner designed the site layout and grading, including the alignment and number of retaining wall tiers. The general contractor for the project was tasked with selecting a SRW supplier. The wall supplier, in turn, retained an external consulting firm to act as the wall designer. Throughout the design process, the original geotechnical investigation firm was not involved, neither was any other geotechnical investigation firm. During construction, the owner hired a second geotechnical consulting firm to provide geotechnical quality assurance services. The wall was constructed over a winter season. Immediately following the completion of construction, the wall started experiencing excessive vertical and horizontal movements which eventually necessitated partial removal of the retaining walls as a safety measure. Case History 2: This project incorporated SRWs at the corner of a parking lot at a commercial storage facility. The wall height was relatively shallow with an exposed wall height of up to 1.5 m. The owner of the project retained a civil engineer and an architect to design the site layout as well as site grading and services plan. The owner also hired a geotechnical engineer to complete a geotechnical investigation for the site development. The general contractor was tasked with selecting a SRW supplier. A proprietary SRW system was selected; however, none of the parties retained a wall designer. The contractor installed the wall reportedly following the manufacturer’s recommendations. The civil engineer or the geotechnical engineer were not involved in design review or construction inspections for the SRW. Approximately one year after the completion of construction, large sinkholes formed in the retained pavement surface immediately behind the retaining wall following a heavy rainstorm. The sinkholes extended down to the base of the walls. The embedment in front of the wall was eroded, exposing the bottom blocks and leading to erosion of the compacted base, and undermining portions of the wall. As mentioned before, these systems warrant a co-ordinated and interdependent design effort among the various parties. Per best practice in the industry, the wall designer, or engineer-of-record, is responsible for checking both the ‘external’ and ‘internal’ stabilities. The external stability checks include the classic modes of failure for retaining walls – sliding, overturning, bearing capacity. Additionally, reinforced SRW or MSE walls require checks on internal stability (reinforcement fracture, pullout and connection strength with the facing blocks). The owner’s geotechnical engineer should check for global stability and suitability of site soil parameters assumed by the wall designer. For special geometries (e.g., tiered systems), these walls also require a design check for ‘compound’ failure mode. There has been some debate in the industry, however, about who should be responsible for compound stability check (wall designer or geotechnical engineer), as well as internal drainage design for these systems, as discussed during a recent expert panel discussion on MSE wall design in Toronto. Finally, the project civil engineer is responsible for coordinating the efforts of all parties and ensuring integration of the wall design with the overall site grading, servicing and drainage plan. Depending on the contracting arrangement and level of expertise, the civil engineer can also act as the wall designer in some cases. Regarding current procurement practices with the contractor retaining the wall designer similar to a design-build arrangement, the NCMA advocates the alternative of having the owner engage the services of a wall designer to keep design and construction roles separate and avoid potential conflicts of interest. While large public sector projects often benefit from design-build arrangements, recent experience with privately owned SRW projects support a direct contractual relationship between the owner and the wall designer to best protect the interests of the owner, and reduce the number of losses related to the failure of these systems. Regarding the misconceptions surrounding the wall manufacturer’s role, it is important to be aware that the manufacturer typically provides only general design drawings and installation guidelines accompanying their products. These documents should not be used for final design without modification to suit site-specific conditions and without the aforementioned multi-stage review process. Unless specifically retained to do so, the manufacturer usually does not take responsibility for a site-specific design. The Transportation Association of Canada (TAC) published a document in July 2017 titled “Design, Construction, Maintenance and Inspection Guide for Mechanically Stabilized Earth Walls” which should serve as a useful reference for project owners and their consultants, both in the public and private sectors, to manage the performance of SRW systems throughout the lifecycle of these structures. The TAC reference should provide a local perspective and complement the information previously available through the aforementioned US agencies. In conclusion, SRW systems offer versatility, economy and durability in meeting a site’s grading requirements. However, a lack of understanding of the design and construction responsibilities often lead to physical damage of these systems. The resulting insurance and legal claims can take considerable effort to resolve due to the complexity of the contributing factors and, as such, can significantly delay a project’s schedule or hamper the operations of a facility. The onus ultimately lies with the project owners and their prime design consultants to understand and manage the design, construction and maintenance of these systems. 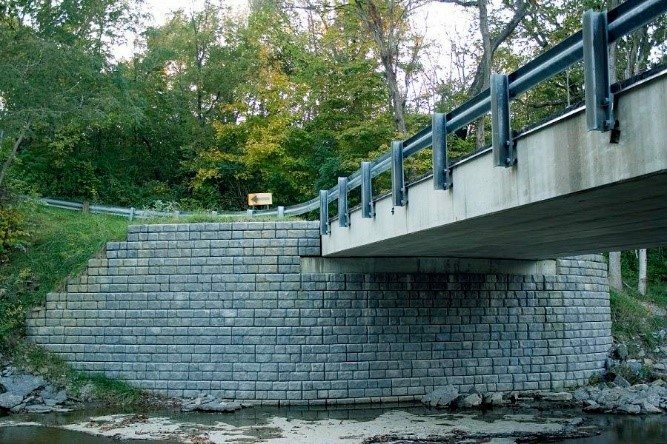 NCMA guide titled “Segmental Retaining Walls, Best Practices Guide for the Specification, Design, Construction and Inspection of SRW Systems”, TR308, dated March 2016. FHWA report titled “Design and Construction of Mechanically Stabilized Earth Walls and Reinforced Soil Slopes – Volume I”, FHWA-NHI-10-024, dated November 2009. In a global stability failure, the retaining wall fails as part of a larger failure mass (wall ‘goes along for the ride’, so to speak) where the ‘slip surface’ or failure plane originates outside/upslope of the reinforced wall zone, passes under the wall and exits downslope of the wall. In this failure mode, the slip surface originates upslope of the wall but passes through the reinforced zone of the wall. Organized by the Canadian Geotechnical Society – Southern Ontario Section in March 2017.